Clad in the uniform of his hometown team, Paul Molitor stood on third base after he collected the 3,000th hit of his major-league career. The first player ever to reach the milestone with a triple, Molitor enjoyed a number of memorable moments in a Minnesota Twins uniform through the final three seasons of his 21-year Hall of Fame career. Just the 21st player ever to reach the magical mark, he was the second from St. Paul, Minnesota. Dave Winfield, who like Molitor had emerged from the sandlots of St. Paul to star for the University of Minnesota Golden Gophers, had achieved the milestone three years to the day earlier, also in the uniform of the Twins in the twilight of a Hall of Fame career. Molitor’s path to third base that September evening in 1996 took many turns. Hamstrung by a series of devastating injuries early in his career as an infielder with the Milwaukee Brewers, Molitor developed a reputation for fragility, and it appeared that his career was cursed as seasons were cut short. But the soft-spoken right-handed hitter from St. Paul persevered to achieve milestones of durability as a designated hitter for the Toronto Blue Jays and the Twins. In 21 seasons, he collected 3,319 hits in 2,683 major-league games, belted 234 homers, scored 1,782 runs, and drove in 1,307. A seven-time American League All-Star with a smooth swing, above-average speed, and outstanding base-running skills, he finished his career with a .306 batting average and became just the sixth player in major-league baseball history to collect 3,000 hits and 500 stolen bases. A fixture atop the Milwaukee lineup for 15 years as one of baseball’s best-ever leadoff hitters, Paul Molitor was nicknamed the “Ignitor” for the spark he generated—a nickname he never really warmed to. “Aside from its not even being spelled right,” Molitor quipped, “it’s a terrible nickname. I never once entered a room and my friends said, ‘Hey, it’s the Ignitor!’”1 Still, as the leadoff hitter in the Brewers’ batting order for a decade and a half, Molitor ignited rallies for Harvey’s Wallbangers, the 1982 team that he and close friend Robin Yount led to Milwaukee’s only American League pennant and World Series appearance. “I think he’s one of the best baserunners—not for speed but for instincts—in the game ever,” his one-time manager Tom Trebelhorn marveled.2 As to his overall impact, “In Milwaukee, It’s God, Robin Yount, and Paul Molitor,” Brewers teammate Dave Engle once observed. A player representative for much of his career, Molitor was at the center of several well-publicized contract negotiations. He won a battle with cocaine abuse during the injury-ravaged early part of his career, overcame the negative publicity that surrounded his mention in the trial of a prominent drug dealer, and delivered persuasive anti-substance-abuse messages to young people later in his career. 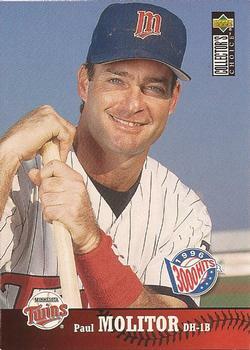 Popular in both Milwaukee and Minnesota, Molitor remained close to baseball after his active career ended in 1998. Molitor attended Cretin High School (now coeducational Cretin-Derham Hall), a Catholic-military prep school that is legendary for its athletics. One of the best athletes in the school’s storied history, Molitor lettered in soccer, basketball, and baseball in his sophomore, junior, and senior seasons from 1972 to 1974 and won titles in each sport. He was named all-state in both baseball and basketball.9 In baseball he played for legendary baseball coach Bill Peterson, who also coached Molitor in American Legion ball. Molitor started his junior season slowly, which coach Siebert attributed to “pressing with so many major-league scouts following him.”18 He soon recovered and turned in a fine junior season, if slightly below his phenomenal sophomore performance. He hit .325 with six home runs and 20 stolen bases and repeated as an All-Big-Ten first-teamer. The team finished 39-12 and again qualified for the NCAA postseason. Playing in the Mideast Regional at home at Bierman Field, the Gophers won three games to qualify for the College World Series, their fifth and most recent appearance as of 2008. The team lost two of three games, the final to eventual champion Arizona State, and finished sixth. His solid half-season earned Molitor a trip to the Brewers’ spring training in Chandler, Arizona. New manager George Bamberger and general manager Harry Dalton had inherited a Milwaukee squad that finished sixth among the seven teams in the American League East Division in 1977, ahead of only the expansion Toronto Blue Jays and 33 games behind the world champion Yankees. The Brewers intended to farm the St. Paul native to Spokane in the Pacific Coast League for additional seasoning. Yount, however, was unavailable to start the season due to an injured foot and his threats to become a professional golfer. In response, Bamberger named Molitor his starting shortstop and leadoff hitter despite only a half-season of minor-league experience, in Class A at that. The Ignitor made his major-league debut on Opening Day, Friday, April 7, 1978, at County Stadium. He grounded out in his first at-bat, then singled to left and drove in a run against Baltimore’s Mike Flanagan in the second inning in an 11-3 win. A day later, he hit his first home run, a three-run shot off Joe Kerrigan, singled twice, and drove in five runs in Milwaukee’s 16-3 win over Baltimore. On the season’s third day, he collected three more hits. When Yount returned to reclaim the shortstop spot, Bamberger moved Molitor to second base. He continued to hit and boasted a .332 average in mid-June. Bamberger immediately took to his new second baseman. “He had tremendous instincts and you could see right away he was a talented athlete.” Bamberger said. “Not only physically but mentally, too. He played the game like he had been up here for years.”23 But Molitor batted just .183 in the season’s final month and Bamberger theorized that he was tired: “I don’t think he was used to playing that much baseball. As hard as he played, and as little pro ball as he had played, he got tired, I think. His bat slowed down.”24 Nevertheless, Molitor finished with a .273 average and 30 stolen bases to earn The Sporting News Rookie of the Year honors. While the Brewers didn’t challenge either the Yankees or the Red Sox in 1978, they did improve from 67 victories to 93 under Bamberger. He started the 1980 season much the same way. But on June 6, batting .358, Molitor pulled a muscle in his rib cage and was forced out of the lineup for six weeks. Elected to the American League All-Star team for the first time, Molitor attended the game in Los Angeles though he didn’t play. To fill in while he recovered, the Brewers installed Fond du Lac, Wisconsin, native Jim Gantner, who would become one of Molitor’s close friends, at second base. While he was laid up, Molitor’s cocaine use, begun recently under peer pressure and out of frustration with his injuries, slipped out of control.27 Anxious to rejoin his teammates, he may have returned before he was ready, and his average slipped to .304 by season’s end. As the 1981 season opened Molitor struggled in the outfield but seemed to be catching on quickly. Manager Rodgers, emotionally vested in the decision, probably overstated a bit when he later remarked of Molitor, “He was already better than the average center fielder. He was as good overall as [Chicago’s] Chet Lemon.”30 At the plate, Molitor hit the first grand slam of his career on April 22, but his season was cut short on May 3 in Anaheim when he suffered an ankle injury trying to beat out a grounder. While he was injured the major-league baseball players went on strike; when they returned, it was decided to split the season into two halves. Molitor returned to the Brewers’ lineup on August 12 and produced just adequately over the remainder of the season. For the last four games of the season Rodgers adjusted his positional experiment and moved Molitor to right and Thomas—who had played center field during Molitor’s absence—back to his natural position. The team edged the Tigers to win the East Division second-half race and the right to meet the first-half champion New York Yankees in the divisional playoff series. Molitor collected five hits in the series against the Bronx Bombers and hit a home run to win Game Three, but New York won the series three games to two. Molitor’s overall performance for the season was the worst of his career for any year in which he collected substantial playing time. Rodgers decided to move Molitor again in 1982, this time to third base, and Molitor was getting frustrated. “Last year they told me I was the center fielder of the future. Now I’m the third baseman of the future,” he deadpanned. “If [closer] Rollie Fingers retires in a few years, I might be the relief pitcher of the future.”31 To ease his concerns, Molitor received some comfort from Brewers owner Bud Selig, who told him it would be the last change—a curious involvement by an owner in the on-field decision-making. The team started the season slowly, and, with the Brewers floundering in fifth place on June 2, Dalton replaced Rodgers with Harvey Kuenn. Energized, Harvey’s Wallbangers posted a 25-11 record before the All-Star Game and grabbed a share of first place in the East Division. The Brewers battled Baltimore down the stretch, and won the division title with a 95-67-1 record on the season’s final day when Yount homered twice and veteran right-hander Don Sutton stopped the Baltimore Orioles. In an injury-free year, Molitor played in 160 games, led the league with 136 runs scored, stole 41 bases, and collected 201 hits, third in the league behind teammates Yount (210) and first-baseman Cecil Cooper (205). He was positioned to lead the Brewers into their first League Championship Series. The American League West champion California Angels quickly gained the advantage when they jumped out to wins in the first two games, at Anaheim, despite Molitor’s inside-the-park home run in Game Two. The Brewers bounced back when the best-of-five series moved to Milwaukee, and they won the next three games at home. Molitor homered again, this time hitting one over the fence at County Stadium. For the series, Molitor keyed the Brewers offense by slugging .684, scoring four runs and driving in five. Milwaukee opened the 1982 World Series at Busch Stadium, home of the National League champion St. Louis Cardinals. 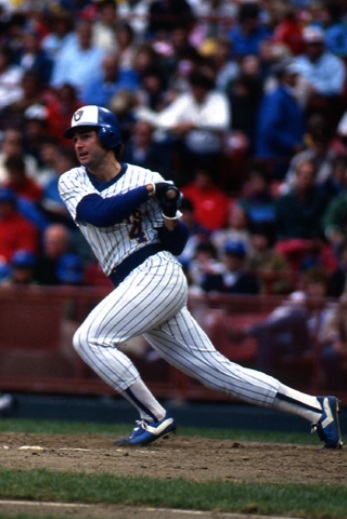 In the first game, Molitor set a fall classic record with five hits, all singles, to lead the Brewers to a 10-0 win. Cardinals manager Whitey Herzog was surprisingly dismissive of Molitor’s feat: “I ain’t runnin’ down Molitor. . . . he’s a heck of a ballplayer, but he had only one line drive. He had three infield singles and a broken-bat bloop. Nothin’ you can do to stop things like that.”32 After the Cards won the next two games, Milwaukee captured Games Four and Five in Milwaukee. But a fourth win proved elusive. Back home at Busch, the Cardinals won Game Six 13-1. Molitor, who hit .355 for the Series, collected two hits in Game Seven, but the Cardinals won 6-3 behind Joaquin Andujar and Bruce Sutter. After their 1982 season, the Brewers suffered a letdown in 1983. Molitor, who signed a five-year $5.1 million contract before the season, injured his wrist swinging a bat in May. With the sore wrist, Molitor struggled through the worst slump of his career, a 2-for-41 stretch in which he went hitless in the last 25 at-bats.33 Near the end of the slump, Molitor missed 10 games as he rested his wrist. He batted .270 in 152 games, and the team fell to fifth. In the spring of 1984, Molitor was diagnosed with a slight tear in the medial collateral ligament in his right [throwing] elbow. He opened the season limited to designated-hitter duties and in late April tried a few games at third base. The elbow, however, was growing increasingly sensitive, and with Molitor hitting just .217 on May 1, the Brewers shut him down for season-ending Tommy John surgery. (Named after Tommy John, a pitcher who successfully resumed his career after this surgery, the procedure consists of replacing a ligament in the elbow with a tendon from elsewhere in the body.) Milwaukee, just two years removed from a World Series appearance, slid to last place in the American League East, 36½ games behind the Detroit Tigers. After the season, Molitor’s wife, Linda, gave birth to the couple’s daughter, Blaire. Bamberger returned to the Brewers’ helm for the 1985 season, and he returned Molitor to third base and the leadoff position in the batting order. Bamberger was concerned about Molitor’s elbow early in the season and tried to play him no more than four games in row in the field.35 The elbow responded well, however, and Bamberger played Molitor at third base in 135 games. On July 2, Molitor doubled and scored the winning run against Boston for his 1,000th hit. Shortly thereafter, he played in the All-Star Game in Minneapolis with fellow St. Paul natives Dave Winfield and Jack Morris. His season appeared to be relatively injury-free until the end of August, when he missed two weeks with a sprained ankle. Molitor suffered though another injury-plagued season in 1986. He tore his hamstring on May 9 charging a bunt in Anaheim. He hit a home run when he returned on May 30 but played in just three games before he aggravated the injury and went back on the disabled list. Molitor returned on June 17 for two games before again tearing his hamstring chasing a fly ball while playing left field.36 He came back on July 9 as the designated hitter; later that month the team moved him back to third, and Molitor played the rest of the season relatively injury-free. 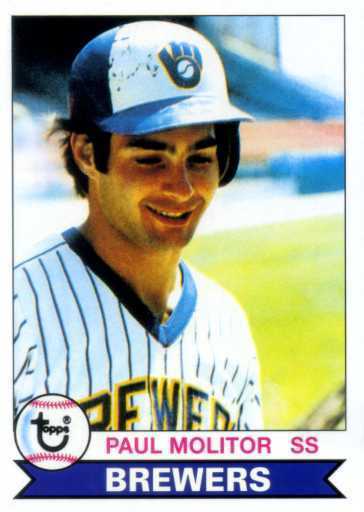 In one of the best games of his career, on August 19, Molitor led the Brewers to a 5-3 win in Cleveland by slugging two home runs and two doubles. He finished the year with a .281 batting average in 105 games and unexceptional on-base and slugging averages. At this point in his career Molitor’s star had begun to dim a little: he was now 30 years old, three years removed from playing more than 140 games in a season and four years removed from hitting .300. Milwaukee started the 1987 season red-hot, tying the modern major-league record with 13 straight wins from the opening bell. Molitor helped key the streak by batting .395 in the first 20 games, 18 of them Brewers wins. Unfortunately, the injury bug struck once more when he was caught in a rundown between third and home and again tore his hamstring. Out four weeks, he came back, but then missed games with groin and elbow injuries before re-injuring his hamstring. When Molitor returned to the lineup on July 16 at home against California he had one hit, a double in four at-bats. Now limited to designated-hitter duties, over the next couple of weeks as Molitor consistently rapped out hits, he began attracting attention for his consecutive-game hitting streak. Joe DiMaggio’s 56-game hitting streak has long been one of the most venerated streaks in sports, and even getting within shouting distance of this mark attracts enormous attention. As the pressure on Molitor mounted, he tried to keep the streak in perspective. “When you start a streak like this you’re preparing for the end, anyway,” Molitor said as the streak reached 34 games. “Initially I’ll be disappointed. It’s a unique opportunity to have a streak go on like this. But it shouldn’t take me long to get over it. It won’t be like the world came out from under me.”37 In Milwaukee on August 23, Molitor went 1-for-4 against Kansas City to raise the hitting streak to 38 games and pass Tommy Holmes for the seventh-longest streak in major-league history. Three nights later Molitor was at home against Cleveland and going for his 40th consecutive game with a hit, which would tie Ty Cobb for sixth on the all-time list. Hitless in his first four at-bats, Molitor was on deck in the 10th inning when Rick Manning singled home the winning run. The fans were unnaturally subdued as the winning run crossed the plate, and Molitor joked about putting his hands up in the air: “People thought I was telling Mike [Felder] to score without sliding. What I was really doing was telling him to go back to third.”38 He also remembered the response from the fans: “When I headed for the dugout, the crowd got on its feet and gave me an ovation. That was probably the most emotional moment of the streak for me.”39 Molitor’s 39-game hitting streak was one of the longest in baseball history. Only Joe DiMaggio, Pete Rose, George Sisler, and Ty Cobb crafted longer streaks in modern baseball; Willie Keeler and Bill Dahlen did so in the 1890s. After offseason arthroscopic surgery on his elbow, Molitor signed a two-year, $2.8 million contract, laden with bonuses based on games played.41 Relatively healthy, the Ignitor started the 1988 season as a designated hitter but soon reclaimed his spot at third. Molitor was named the starting American League second baseman in the All-Star Game, despite appearing in only one game at the position. At the end of the 1987 season, Molitor had been moved over to second base briefly, and that was where he was placed on the ballot for 1988. Star second baseman Julio Franco was bitter over Molitor’s starting berth: “The guy’s played only one game at second and he deserves to go more than me?”42 For the season, despite a nagging hamstring problem, sore wrist, and aching elbow, Molitor earned his playing time bonus by appearing in 154 games. Molitor began the 1989 season on the disabled list with a dislocated finger, but he recovered quickly and joined the team in mid-April. He remained healthy throughout the remainder of the season, and again received his performance bonus when he played in 155 games. In another strong season, despite one of the longest slumps of his career after the All-Star break, Molitor hit .315 with 27 steals. A regular at third base through the bulk of the season, he was switched to second near its conclusion by manager Tom Trebelhorn. The Brewers had two young shortstop prospects, Bill Spiers and Gary Sheffield, and Trebelhorn wanted to get them both into the lineup, one at short, the other at third. Before the 1990 season, Molitor reached an agreement with the Brewers for a three-year, $9.1 million contract, then one of the largest in baseball, and along with his friend Yount, the second $3 million-plus salary on the club. Only one other team, the Oakland Athletics, had two $3 million-a-year players, and some questioned the Brewers’ wisdom on account of Molitor’s injury history. In fact, 1990 did become one of Molitor’s more frustrating seasons. Heading into spring training the Brewers’ infield was completely unsettled. Molitor, Sheffield, Spiers, Gantner, and Dale Sveum, the starting shortstop in 1987 and 1988, were all vying for three positions (second, third, and short). Unfortunately for the Brewers, as the injury bug bit, the Brewers actually found themselves with too few alternatives, not too many. The 33-year-old Molitor was bothered by a sore shoulder in spring training, then fractured his thumb. He missed a month, and when he returned Trebelhorn put him at second to reduce the strain on his shoulder.43 In mid-June, Molitor suffered a fractured finger when he caught his hand in the glove of Cleveland’s Brook Jacoby and missed another six weeks.44 He returned at the end of July but was unable to throw because of the sore shoulder. Trebelhorn shifted him to first base, which riled regular first baseman Greg Brock and triggered his agent complaining to Dalton.45 Brock’s unhappiness only added to an already restless clubhouse—Sheffield, for example, wanted to be a shortstop, not a third baseman—and the struggling team dropped to sixth place after a .500 finish the year before. Molitor hit .285 in only 103 games, and his 1990 season ended prematurely when he collided with Jim Gantner in the final week. Already slated for shoulder surgery, he underwent a separate surgery on his forearm to repair the injury. Molitor returned to full-time duty in 1991 but, no longer able to throw, was now limited to designated hitter and first base. For some reason Molitor flourished as a designated hitter—his position during the 39-game hitting streak—and over the remainder of his career he had some of his best seasons despite his advanced age (he turned 35 in August). On May 15 in Minnesota, Molitor hit for the cycle, and later in the year he singled off Bret Saberhagen for his 2,000th hit. Overall, belying his injury reputation, Molitor played in 158 games and led the league in plate appearances and at-bats. He performed well in all those opportunities: he batted .325 with a new career-high 216 hits, led the league with 133 runs scored, tied for the league lead in triples with 13, and finished eighth in OPS at .888. Milwaukee brought in manager Phil Garner for 1992, and in late May the new skipper moved Molitor out of his familiar leadoff spot to third in the Brewers’ batting order. Molitor thrived in his new role. He batted .320 and drove in 89 runs, was named to the American League All-Star team, and led Milwaukee to a second-place finish in the American League East Division, the best by the Brewers in a decade. But the Brewers faced a difficult decision at the end of the season. Molitor, who had turned 36 in August, was a free agent, and Milwaukee’s ownership, which now behaved like a so-called small-market franchise, did not feel comfortable paying his market value. While his teammates mourned, Molitor moved on with some trepidation but ready to embrace his new opportunity. He moved his family to Toronto and showed up at spring training ahead of schedule. Molitor, who opted to wear number 19 on his Toronto uniform in honor of Yount, joined a veteran team that had won the World Series the year before. He was slated to replace a St. Paul native, 1992 designated-hitter Dave Winfield, in the Blue Jays lineup (Winfield had moved on to the Twins), and join another hometown product, pitcher Jack Morris. Molitor quickly endeared himself to the fans north of the border. In May, he hit .374 and earned American League Player of the Month honors. In July, Blue Jays manager Clarence “Cito” Gaston, the American League field boss for the All-Star Game by virtue of the World Series appearance, selected Molitor for the A. L. squad. The Ignitor validated Gaston’s confidence in his abilities by hitting .361 after the break, and he finished second in the league batting race behind teammate John Olerud. Molitor also drove in 111, scored 121 runs, and led the league with 211 hits. Molitor was able to set aside the resulting uproar for the postseason. In the American League Championship Series opener in Chicago he collected four hits, including a two-run homer, in Toronto’s win, then followed up with two more hits in Game Two as the Blue Jays won again. Chicago captured the next two games, in Toronto, before the Jays won Game Five at Skydome and Game Six in Chicago. In the latter Molitor’s ninth-inning triple plated a couple of insurance runs in a 6-3 victory. For the series Molitor hit .391 and drove in a team-high five runs. Set to appear in his second World Series, Molitor became the center of speculation. The Phillies and Jays split the two opening games in Toronto, and the question of the hour was how Cito Gaston would use Molitor in Philadelphia, the National League city, where he was unable to employ a designated hitter. In a gutsy decision, against the Phillies’ left-handed pitcher Danny Jackson, Gaston benched left-handed-hitting John Olerud, the league batting champion, in favor of Molitor, who had played just 23 regular-season games at first base. The move paid off. Molitor, the third hitter in Toronto’s order, drove in two runs with a triple in the first inning and scored on Joe Carter’s sacrifice fly. He later slugged a solo home run and a single in a 10-3 win. For Games Four and Five Gaston decided to risk Molitor’s weak throwing arm at third base in place of the light-hitting Ed Sprague. Gaston felt he could run this risk because the Phillies were mostly a left-handed-hitting team. As it turned out, Molitor threw over to first base only three times in the two games, and all the throws were on target.50 Game Four itself was a slugfest. The Jays outlasted the Phillies 15-14 in the longest nine-inning and highest-scoring game in World Series history. A day later, Philadelphia’s Curt Schilling shut out Toronto to send the Series back to Skydome. In the six-game series, Molitor collected 12 hits in 24 at-bats, including two doubles, two triples, and two home runs. He scored 10 runs and drove in eight and was named the World Series Most Valuable Player. “In Canada, when you say PM they think of prime minister, but now they might start thinking Paul Molitor!” color analyst Tim McCarver quipped during the TV broadcast. Molitor almost achieved the rare feat of winning the MVP trophy for both the World Series and the regular season, for which the writers voted him second in the MVP balloting. Winfield had parted ways with the Jays after one season and a World Series title, but Molitor, with two years remaining on his contract, stayed in Toronto. Once the 1994 season began Molitor again turned in a stellar, injury-free year. On July 5 in Minnesota he hit the second grand slam of his career. Overall, he led Toronto with a .341 batting average, the sixth best mark in the league, and in runs, hits, total bases, doubles, and stolen bases. But Toronto finished the strike-shortened season under .500. Molitor continued to put his reputation for fragility behind him as he led the league in games played with 115. He was one of several players, including Baltimore’s Cal Ripken Jr., who appeared in all of their teams’ games during the season, but the Jays played one more contest than any other team in the league. Molitor made just five appearances in the field, all at first base. In 1995 Molitor appeared in 130 games, strictly as a designated hitter. The highlight of his season was August 26 and 27 when he put together eight hits in eight at-bats with back-to-back four-hit games. Including the 28th, he reached base on ten consecutive plate appearances. But overall Molitor turned in one of his worst seasons, and at the age of 39 his game appeared to be slipping. His three-year contract now up, Molitor became a free agent at the end of the season. He considered remaining in Toronto or returning to either Milwaukee or Minnesota. In the end he decided on Minnesota, and on December 5, 1995, he signed with the Twins for $2.025 million. Molitor started quickly; his early-season exploits including scoring five runs and driving in five in an April 24-11 win over the Tigers. Later he put together a five-hit game against Toronto in a 6-4, 11-innning win. On September 16, 1996, at Kansas City’s Kauffman Stadium, Molitor singled in the first inning, the 2,999th hit of his major-league career. In the fifth inning, he hit a drive to right field off Jose Rosado and ended up on third base to become the first major leaguer to register a triple for his 3,000th hit. “I don’t know much about that young man [Rosado], but I know he did not try to avoid being the one who gave up my 3,000th hit,” Molitor said. “I know he shook off a couple of signs and threw fastballs—saying, ‘If you’re going to get it, you’re going to get it.’”53 George Brett and Molitor’s friend Robin Yount were among those on hand to see him join them in the 3,000 hit club. The milestone hit came three years to the day after Winfield had collected his 3,000th hit, also for the Minnesota Twins, and the two became the first two players from the same hometown to accomplish the feat. Molitor, the fourth oldest player in the league, appeared in a career high 161 of Minnesota’s 162 games for manager Tom Kelly. He batted .341, third in the American League behind Alex Rodriguez and Frank Thomas. He led the league in hits with 225—becoming the oldest player to ever lead the league in hits54—drove in a career high 113 runs, and scored 99. After the season Molitor chose to remain in Minnesota and signed a two-year contract with the Twins for a substantial pay increase in recognition that his skills had not yet eroded. Unfortunately the injury bug bit again early in the season. Molitor returned to the disabled list for the first time since 1990 after he sprained his left wrist and strained his abdominal muscle in a home-plate collision on April 13 with Kansas City’s Mike Macfarlane.55 He rebounded to have a pretty good season, including five hits in a game against Oakland. He wound up the year hitting .305 with 10 home runs and 89 runs batted in. Molitor returned to the Twins in 1998 for his final season. Just two weeks shy of his 42nd birthday, on August 8 against Baltimore, he turned the five-hit trick again and stole his 500th base. In retirement, honors poured his way. On June 11, 1999, Molitor returned to County Stadium, where the team retired the number 4 uniform he had worn for 15 years as a Brewer. That summer, he ranked number 99 on The Sporting News’s list of the 100 Greatest Baseball Players and was a finalist for Major League Baseball’s All-Century Team. With the uncertainty of contraction and his daughter a senior in high school, Molitor elected to take the year off for some rest and relaxation.61 Molitor missed baseball, however, and in 2003 he took a job with the Twins as a roving minor-league instructor. Seattle Mariners general manager Pat Gillick, who had recruited Molitor to Toronto back in 1993 and unsuccessfully chased him for other positions since his retirement, now targeted him to be Seattle’s batting coach. This time Molitor accepted. One year was enough, however, and after the season the financially secure Molitor—he earned nearly $800,000 in 200462—moved back to Minnesota to resume the less stressful job of a roving minor-league coach. For 21 seasons, Paul Molitor was a great player and a quiet leader. “When I first got to Milwaukee my locker was right next to Paulie’s,” remembered one-time teammate Cal Eldred. “He was an unbelievable teammate. Guys like him and Robin and Gumby [Jim Gantner] just went about their business every day. They didn’t say a lot but when they did, everybody would listen.”67 Molitor achieved his dream, articulated many years earlier in his high-school yearbook, of playing pro baseball and working with people. And Molitor not only played professional baseball, but he became a star: 15 years in Milwaukee as one of the city’s biggest celebrities, a world championship in Toronto, and a final few years in front of his hometown fans in Minnesota. Along the way he used his fame to work with people in his numerous charitable endeavors. 1. Hoffer, Richard. “Career Move,” Sports Illustrated, March 29, 1993, p. 45. 2. The Sporting News, March 6, 1989. 3. Seattle Times, July 25, 2004. 4. Two websites, http://retrosheet.org and http://baseball-reference.com, are essential for verifying and generating game and seasonal information. 5. Unless otherwise noted, the two main sources for Molitor’s early life are Bill Koenig, USA Today Baseball Weekly, April 17-23, 1996, and Jim Souhan, Minneapolis Star Tribune, February 18, 1996. 6. Correspondence with Tony Leseman, Cretin-Derham Hall Development & Alumni/ae Officer, August 4, 2008. 7. Hoffer, op. cit. ; Aschburner, Steve. “Strictly Business,” Inside Sports, June 1994. 8. Marazzi, Rich. “Batting the Breeze,” Sports Collectors Digest, February 26, 1993, p. 190. 9. Correspondence with Tony Leseman, Cretin-Derham Hall Development & Alumni/ae Officer, August 4, 2008. 11. Broomer, Stewart, and Paul Molitor. Good Timing, Toronto: ECW Press, 1994: 17. 12. St. Paul Pioneer Press, September 18, 1996. 14. University of Minnesota press release, June 17, 1976. 16. Minneapolis Star Tribune, July 26, 2004. 17. St. Paul Dispatch, July 7, 1976. 18. Minneapolis Tribune, April 12, 1977. 19. Madden, W. C. Baseball’s First-Year Player Draft: Team by Team Through 1999, p.195. 20. Minnesota Daily, July 28, 2004; Minnesota Daily, February 3 and July 28, 1994. 22. Spink, C.C. Johnson. Official Baseball Guide for 1978, The Sporting News; Johnson, Lloyd, and Miles Wolff. Encyclopedia of Minor League Baseball, 3rd Edition. Durham, N.C.: Baseball America, 2007: 579. 23. Skibosh, Tom. “Paul Molitor: To Catch A Thief,” Milwaukee Scorebook, 2nd Edition, 1979: 9. 24. The Sporting News, October 7, 1978: 27. 25. Gonring, Mike. “Molitor & Yount: Opposites Really Do Attract,” Milwaukee Brewers Program, June 1979: 50. 26. Simon, Ron. The Game Behind the Game: Negotiating in the Big Leagues. Stillwater, Minnesota: Voyageur Press:158. 27. New York Times, August 19 1985; Simon, op. cit. : 158. 29. Okrent, Daniel. Nine Innings. New York: Houghton Mifflin, 1985: 68-69; The Sporting News, April 4, 1981. 30. Okrent, op. cit. : 70. 31. The Sporting News, February 13, 1982: 40. 33. The Sporting News, June 27, 1983: 23; http://baseball-reference.com. 34. Simon, op. cit. : 159-160. 36. Broomer, op. cit. : 66. 37. New York Times, April 21, 1987. 38. The Sporting News, March 28, 1988. 39. John Kuenster, “With 3,319 career hits, Paul Molitor merits Hall of Fame Status,” Baseball Digest, February 2004. 40. Broomer, op. cit. : 89. 41. Broomer, op. cit. : 89. 42. The Sporting News, July 10, 1989: 13. 44. The Sporting News, July 2, 1990: 13. 45. The Sporting News, August 13, 1990: 10. 46. Simon, op. cit. : 182-183. 47. Broomer, op. cit. : 112. 48. Broomer, op. cit. : 112. 49. Broomer, op. cit. : 143-145. 50. The Sporting News, November 1, 1993: 17. 51. Broomer, op. cit. : 176. 52. Tom Verducci, “The Complete Player.” Sports Illustrated, November 1, 1993: 28. 53. Minneapolis Star Tribune, September 17, 1996. 54. Tim Kurkjian, “No Asterisk Necessary,” Sports Illustrated, September 9, 1996: 76. 55. The Sporting News, April 28, 1997: 37. 56. Minneapolis Star Tribune, April 30, 1999, November 24, 1999. 57. The Sporting News, November 10, 1997; November 17, 1997; November 16, 1998; December 6, 1999. 58. The Sporting News, October 23, 2000. 60. The Sporting News, April 29, 2002. 61. Milwaukee Journal Sentinel, August 13, 2002. 62. Toronto Sun, September 16, 2005. 63. Internet Movie Database, http://www.imdb.com; Minneapolis Star Tribune, February 15, 2004, October 13, 2003, November 20, 2005; Toronto Sun, September 16, 2005. 64. Minneapolis Star Tribune, July 26, 2004. 65. New York Times, February 13, 1998. 66. The Rotarian, April 1999. 67. Milwaukee Journal Sentinel, July 24, 2004.